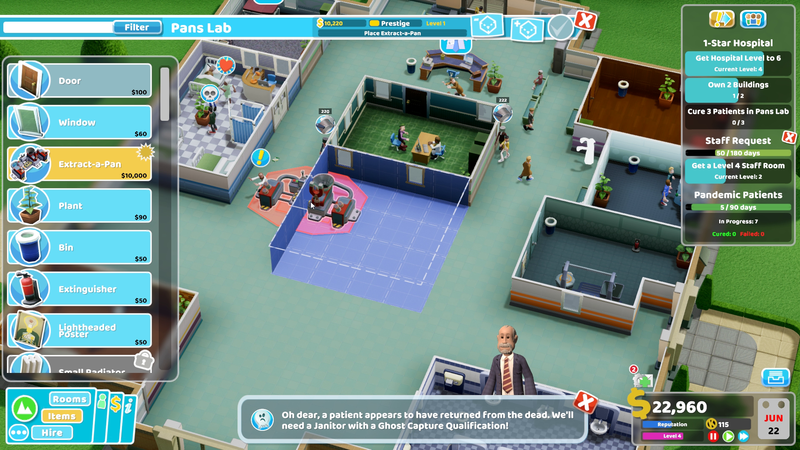 Two Point Hospital has a release date of August 30 and as huge fans of Theme Hospital - which the game is a spiritual successor to - we're massively excited for it. We played several hours of the game, and we also spoke to two of the developers from Two Point Studios. 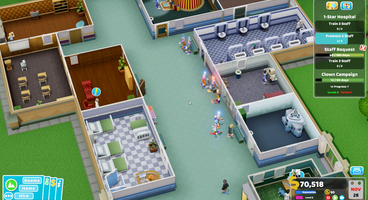 Technical Director and Studio Co-Founder Ben Hymers and Art Director Mark Smart kindly talked to us about the game, fire extinguishers having a purpose, hospital marketing, staff getting Hangry, and moving on from Theme Hospital - and Lionhead Studios. Enjoy! 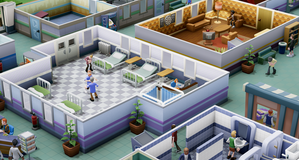 GameWatcher: How will Two Point surpass Theme Hospital entirely? 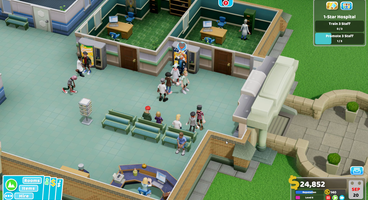 Ben: For starters, there’s been a ton of improvements to games in general since . 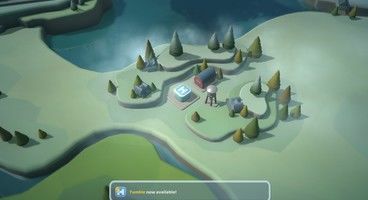 There are certain quality of life things that are just expected in modern games, which we’ve gone all in on so hopefully Two Point is a little friendlier to play. There’s the fidelity of everything, and having a modern game engine has done nice things for animation quality, such as interesting machine effects. It’s no longer limited by silly memory constraints, such as changing screens at two orientations because there’s only enough memory for animations to use them at two. Mark: It’s also the layering on of personality traits, you can do so much more. 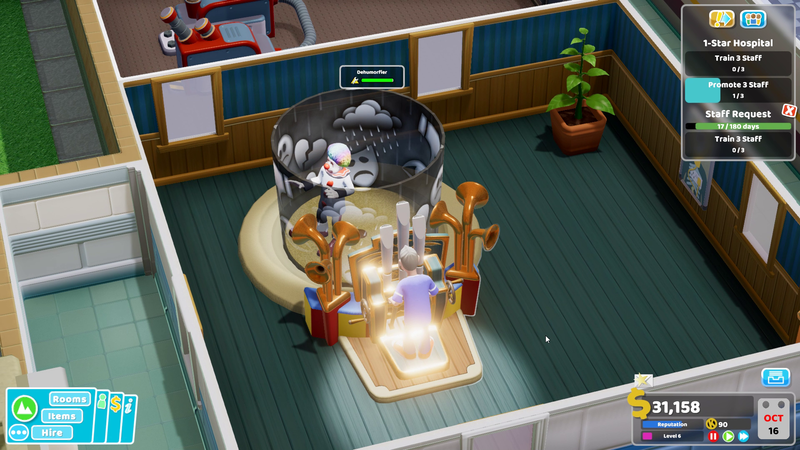 You can train them up or treat them in a particular way, and those traits will become apparent. Ben: There’s just a lot more we can do with the AI and simulation depth quality. A lot more going on under the hood! GameWatcher: What’s your personal favourite new feature? 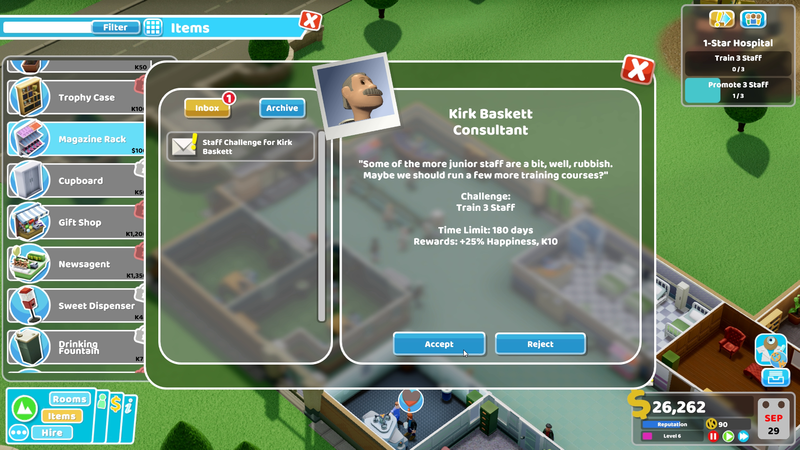 Ben: I’ll say training, which was previously just a progress bar. Now it’s tied in with promotion. Our staff earn experience, get promoted with a training slot, and you can send them to train a specific skill. Some are stat things, others are specific things like Ghostbusting. 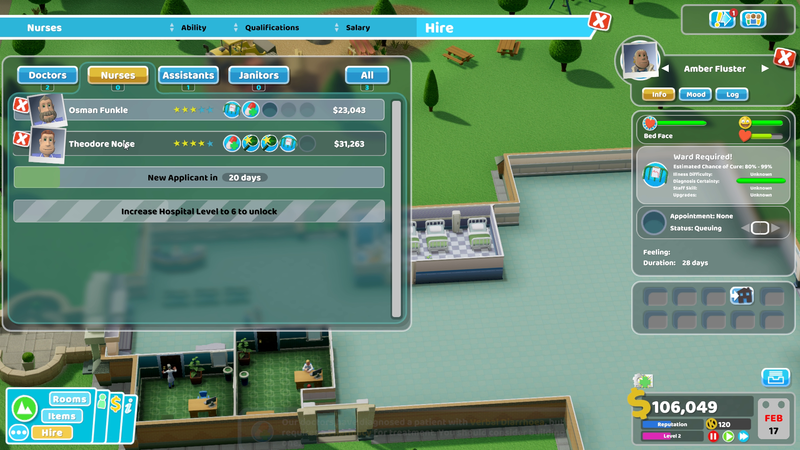 You can mold your staff a lot more. Mark: (calmly) The ability to see behind the walls! 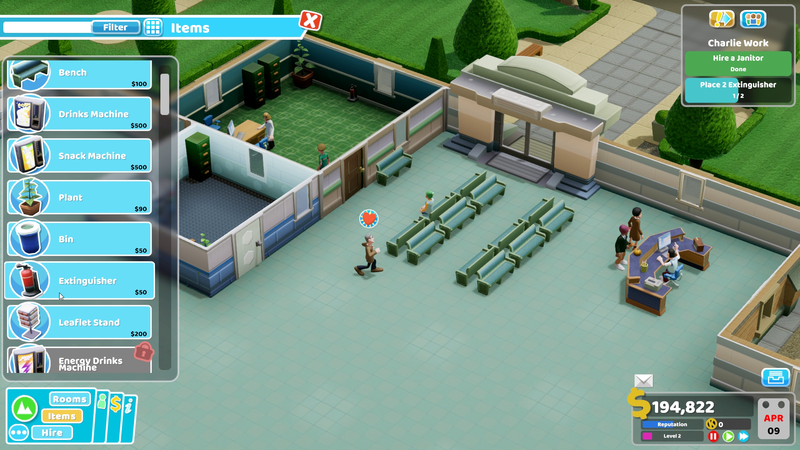 (we laugh) You can decorate your hospital a lot more, and now actually be able to see what you put there! Ben: Yes, they do! 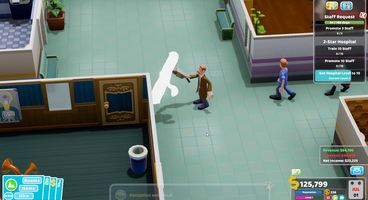 If the maintenance on a machine gets low enough it can smoke and catch fire, and a janitor will run to get the nearest fire extinguisher to put it out. They’re all actual useful items now! Mark: As you go through you’ll find more actual useful items now, including decorative items. 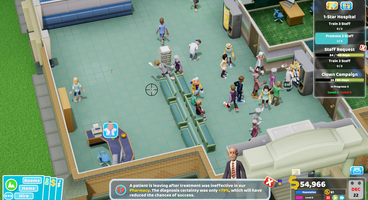 There a mode where you can see how beautiful your hospital is, and it does help build prestige and make more patients come in. Everything affects everything else, even the file cabinets! 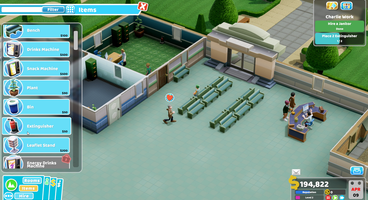 Ben: We’ve gone for quite a deep simulation, where lots of things affect other things and creates emergent behaviour. Everything matters! GameWatcher: Can staff catch diseases? Ben: No! They’re tough, they’ve had their immunizations. Mark: We’re not even sure of the origin of some of these diseases, or how people catch them. Just the condition itself! Ben: One thing they do have to do now is eat. In Theme Hospital they either worked or rested, now they have hunger, thirst, energy and toilet needs - and with our AI improvements they have traits just like patients, all different personalities that act in interesting ways. GameWatcher: What sort of personality traits might start to emerge later? Ben: There’s one called ‘Hangry’, which is a mixture of hungry and angry! 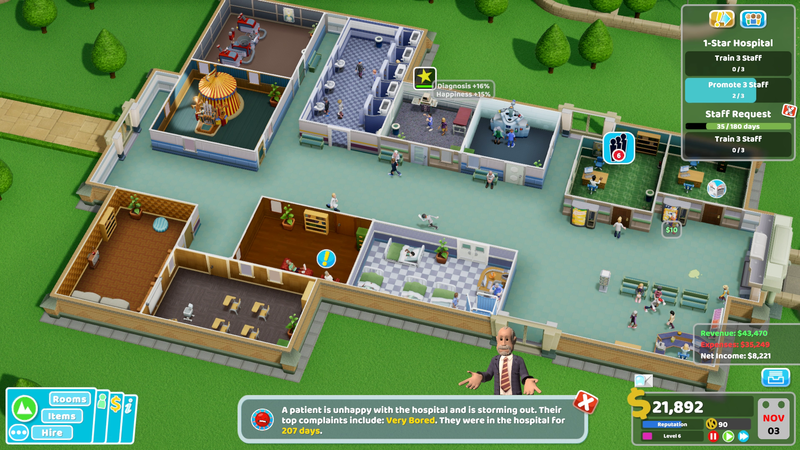 If one of your guys assigned to a GP’s Office gets Hangry you better place some vending machines outside his room, or he’ll start getting angry - which will affect his patients’ mood. Mark: Some staff are just ‘Rude’! You can train them in Bedside Manner to change their nature, to some extent. 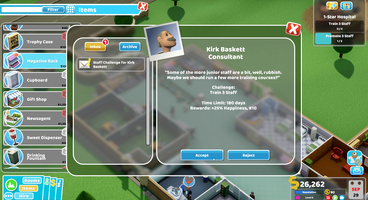 Ben: I like the idea that you can get qualified in ‘Bedside Manner’! “I’ve got a certificate in Bedside Manner”! GameWatcher: How does marketing work? Mark: It increases your reputation. 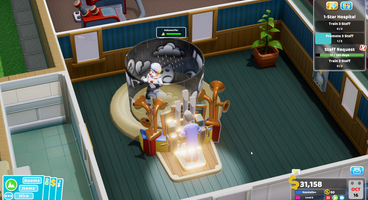 You can set the marketing team to work on a particular project, like telling the public about a great new treatment machine. Ben: It’s quite an advanced thing that doesn’t show up until later, and it allows you to go a bit deeper with how you play. 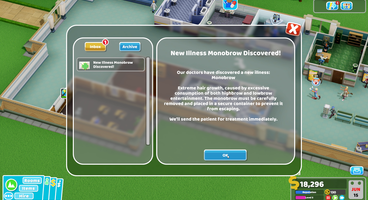 We’ve got someone in the office who uses it extensively to ‘farm’ an illness. Most people build diagnosis rooms, then treatment rooms for different illnesses, but he extensively marketed his hospital’s ability to treat one specific illness and built multiple treatment rooms just for that illness! It’s an interesting, and different, way to play! It’s not how I’d play though! Mark: It does show how you can play the game in a lot of different ways. You’re being guided enough, but you can choose to accept or reject challenges, and it’s up to you how you play it. It’s not a linear game! 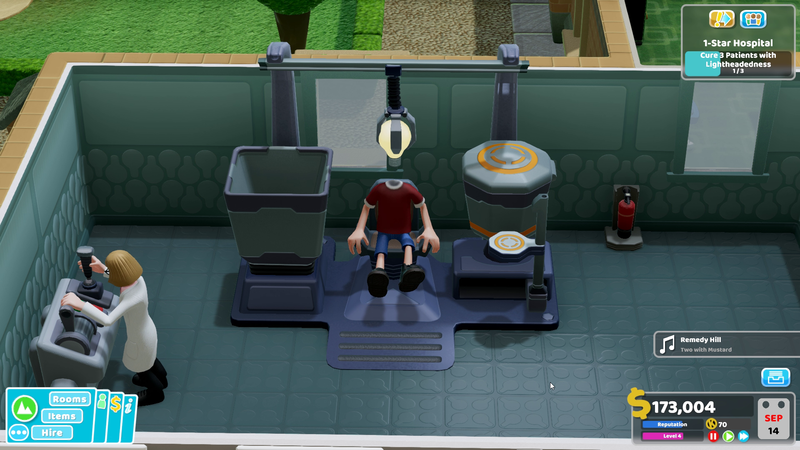 GameWatcher: How does research work now? Ben: That comes in on the fourth level, Mitten University. 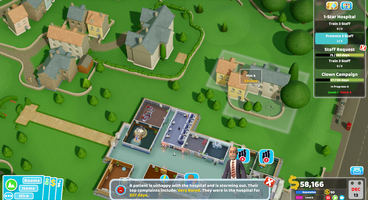 It’s a university research hospital! Mark: You get a room and a desk, and have to staff it with doctors who are trained researchers, even if you have to train them yourself. Then you put them on a research project. 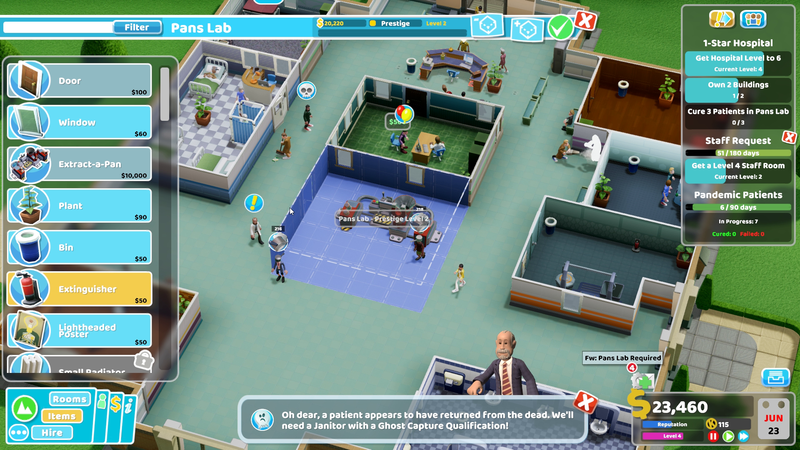 Ben: You kick off research projects by dropping them in the room and selecting the project by clicking on the room. 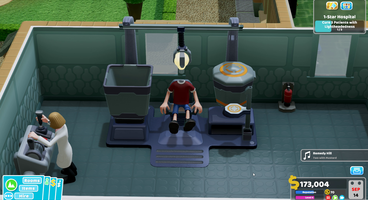 These include unlock treatment machines or upgrades to make machines better at curing people. 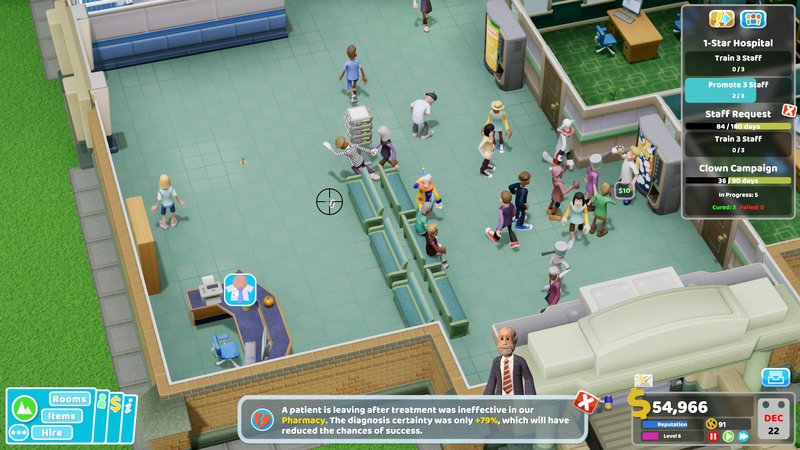 GameWatcher: How many diseases are in the game? Ben and Mark look at each other blankly. 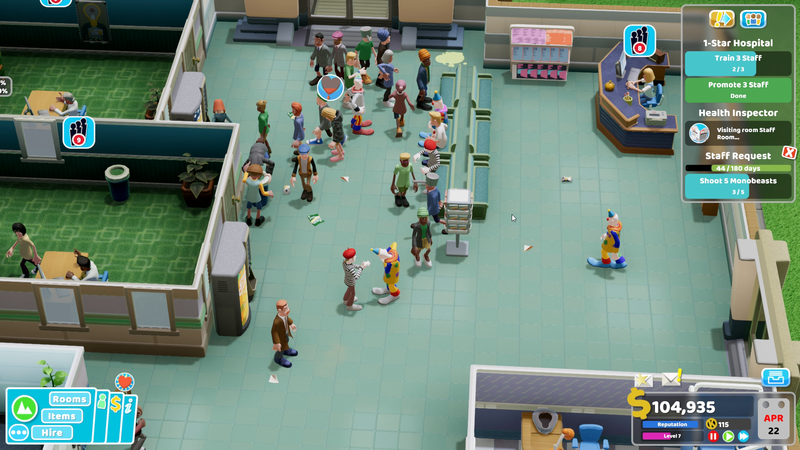 Ben: And a bunch where the people look normal but they have silly diseases… 30? We’ve lost track now! GameWatcher: How long has it been in development? Ben: It started around October-ish 2016, so it will be just under two years when the game comes out. GameWatcher: How much has it changed since the prototype stage? Ben: Everything’s changed quite a lot. 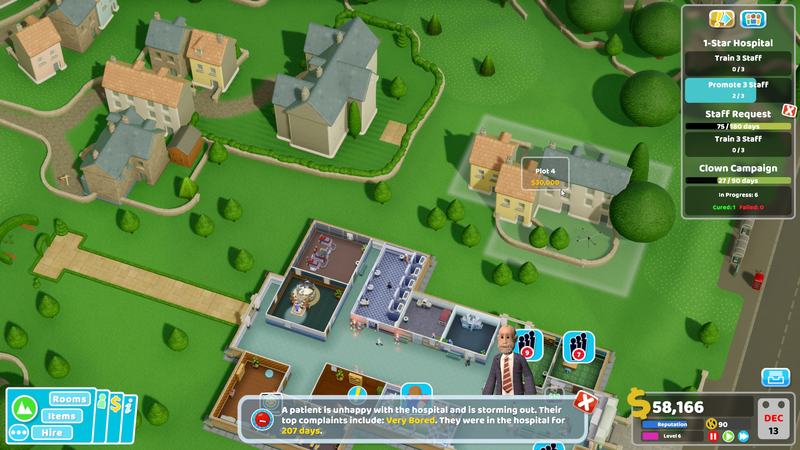 The building system’s seen so much change over time. Mark: Fundamentally everything’s changed over time, but all those iterations are for the better. We’ve not slavishly kept anything. If we thought it didn’t work we just took it out. Ben: It’s nice being on such a small, experienced team, because no-one’s precious about anything, and it’s small enough that anyone can have a big impact. Mark: There have been a number of illnesses that we’ve turned down because of some technical or graphical reason, if we thought we couldn’t pull it off. We never got too far down a blind alley with anything because we could reason it out. 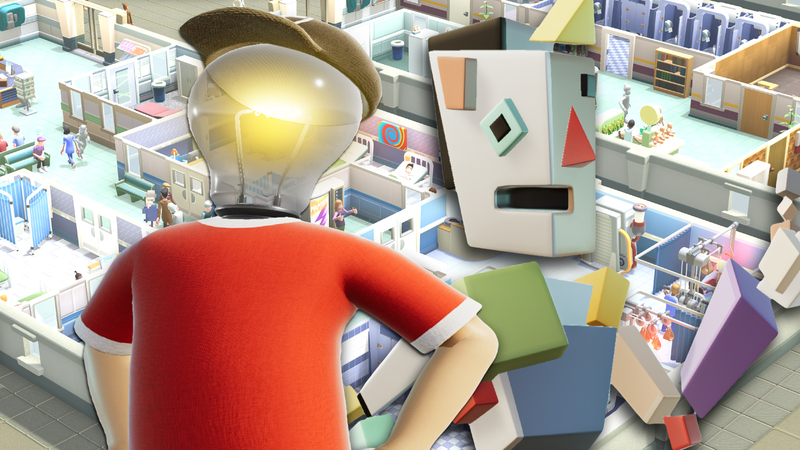 GameWatcher: What’s the silliest idea someone’s had for your next game? Ben: I still want to do this, Two Point Service Station! Motorway services! Everyone thinks I’m joking, but I’m dead serious. I think it’d be brilliant! It’s like Gary [Carr, founder] says, a wacky idea wouldn’t work because it’s already wacky and we can’t twist it, but something like a hospital is ripe for subversion. Mark: It’s that level of mundane that you can apply a level of subversion or absurdity over the top of it. GameWatcher: Are you considering mod support for the game? Ben: Yeah, we’d be silly not to. We don’t have firm plans yet. 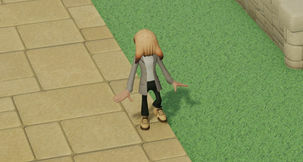 Personally I’m a huge fan of modding in games, and it’s popular for this type of sim game. I’d love to get some level of support in there. 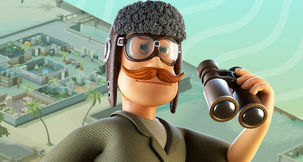 It won’t be for launch, but we shall investigate! GameWatcher: You both worked at Lionhead Studios, right? Mark: And I left when everything went wrong! GameWatcher: After The Movies, were any other management sims in development at Lionhead? 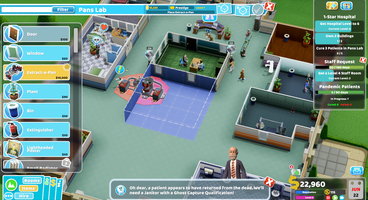 Ben: It’s really how Two Point Hospital got started, me and Gary in the incubation team were doing sim-type games. But with Microsoft being Microsoft it’s tough to convince this corporate entity to change its mind on anything. That’s what spurred us on to start again in a small studio rather than a small part of a big machine. Mark: When I joined Lionhead there were three games in development. After some movement that dropped down to two games, and that dropped down to one game - Fable. It just took everyone’s time - 250 people working on the same thing. Ben: It’s very refreshing, being on a small team, just the 16 of us. It’s very flat, there’s no management, everyone’s just working on stuff and everyone has an input. Which is lovely! 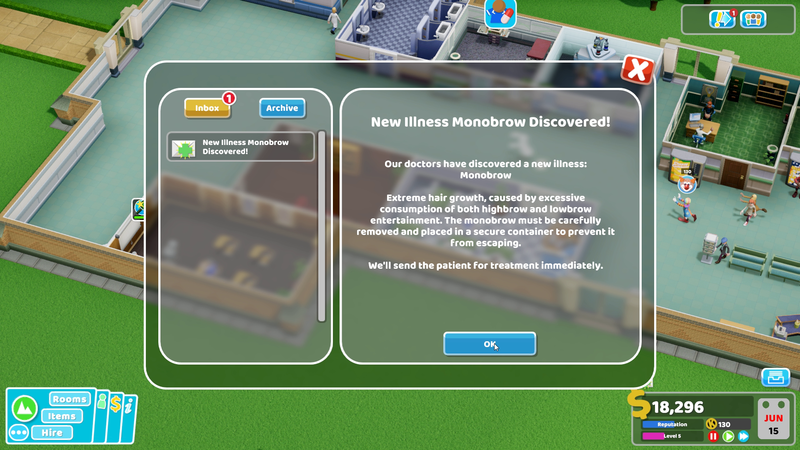 GameWatcher: Are monobrows the only things to shoot in the hospital? Ben: Yes, we don’t want to go too shooting crazy! I really like the monobrows actually. It’s nice when you get lots of them infesting underneath something, you lift it up and they ping off in random directions! They’re kind of gross! 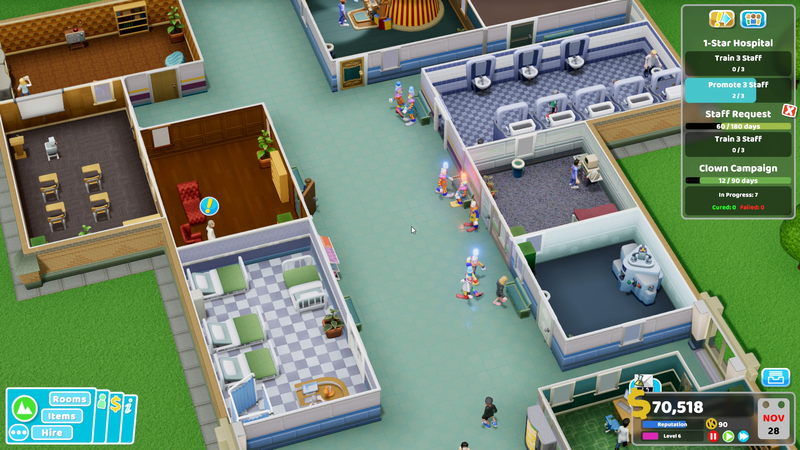 GameWatcher: Do they negatively affect the hospital? Ben: Yes, cleanliness especially. They’re unhygienic! People don’t like them being around. 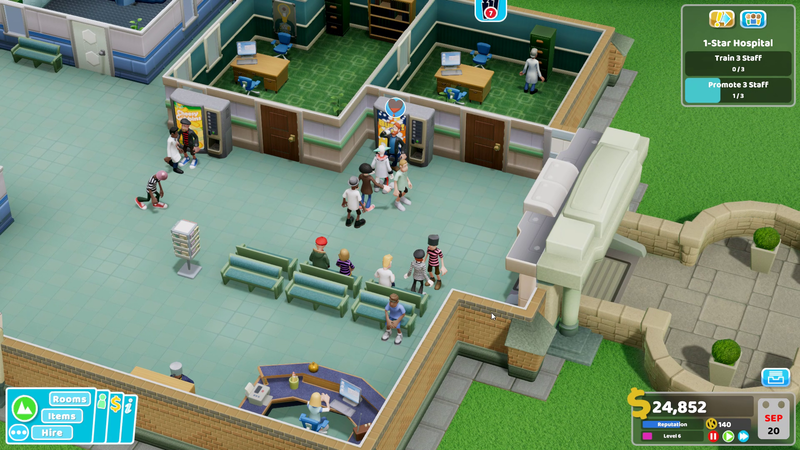 GameWatcher: Before we go, anything you’re particularly proud of about the game? Mark: We hope we’ve made a game that’s accessible to everyone, and that they can play it the way they want to. We’re making something we’d love to play. 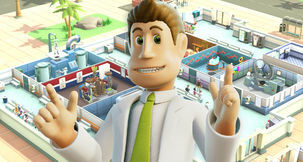 Ben: We’re crafting something nice, and we hope will be enjoyed by a broad range of people - maybe by people who don’t have as much gaming experience. 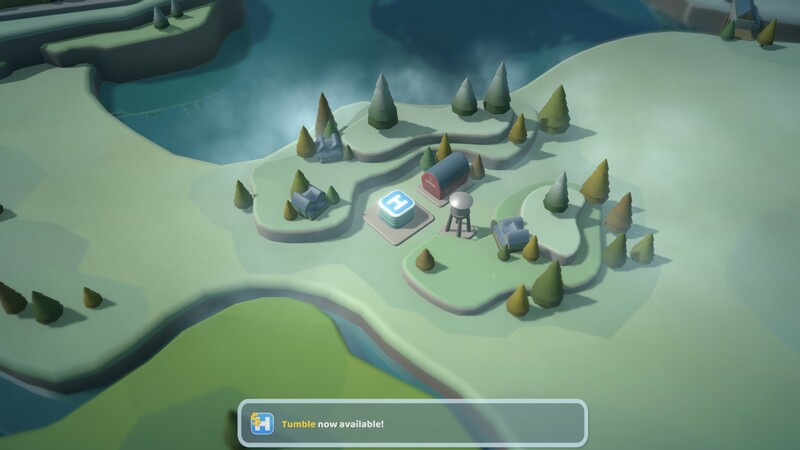 We hope the nice aesthetic and welcoming nature will make it fun for everyone, but we’ve also tried to go deep into simulation-land for those who want to play it like that. > Thanks to both Ben and Mark for talking with us, as well as SEGA for setting it up. You can check out our impressions of the game here, or a solid 30 minutes of exclusive gameplay from our hands-on in the video below.